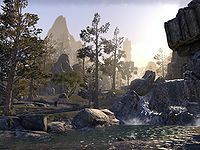 Upper Craglorn is the northern region of Craglorn. The main settlement in Upper Craglorn is Dragonstar, which lies in the northwest of the region. The Dragonstar Arena sits on the hillside above the town. Parts of the region are currently under the influence of the Celestial Serpent. Lower Craglorn lies to the south, accessible through a pass in the southwest, or a defunct barricade in the southeast. Upper Craglorn was originally the only place where Nirncrux trait materials could be found, although they can now be found throughout the whole of Craglorn. ​ Serpents and Secrets 50 Dismantle the Serpent's forces and vanquish the Exalted Viper.